Mrs. Fields custom cookies come in boxes or packages that are imprinted with your brand or logo. Mrs. Fields brand cookies offer a sweet corporate gift for your employees and your clients. Mrs. Fields cookies taste great and will look even better in boxes and tins imprinted with your company name and logo. These cookies are perfect for the holidays or those times when you really want to spread some promotional joy. 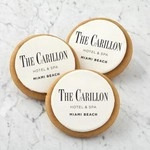 Promotional cookies make a great gift or giveaway for any occasion. Everyone will love these delicious cookies in custom printed boxes and packaging. Find out how easy it is to make them for your company. Call ePromos today.